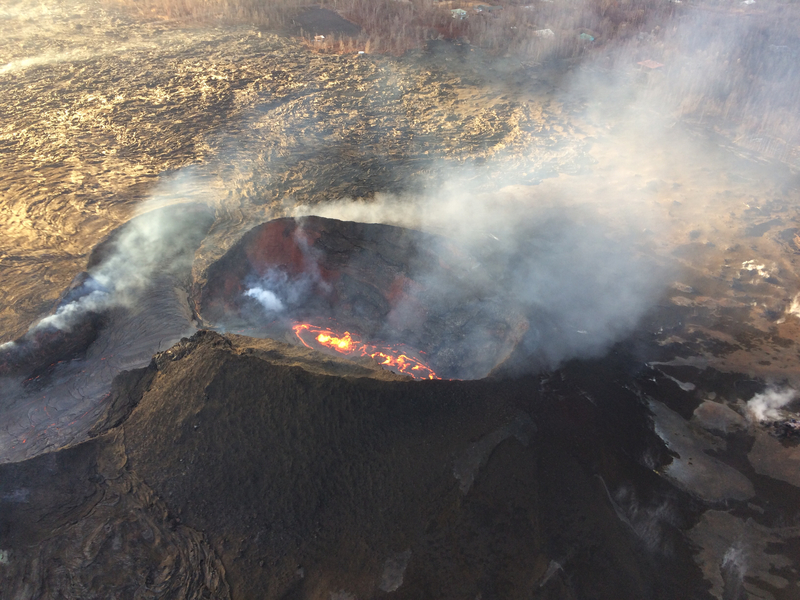 Thursday evening’s Volcano Village meeting (full video here) included a status update on Kīlauea’s summit from HVO geophysicist Ingrid Johanson (starting at timestamp 4:10). Johanson reports that the summit’s collapse cycle continues much as it has for the past two months: M5.3 earthquakes caused by the summit settling into the drained upper magma chamber, low SO2 emissions, not much ash since late May. Johanson showed graphs of tilt/deflation and earthquake frequency illustrating this “collapse cycle,” and noted that the time between collapse events is increasing. Thursday’s collapse (video) was the 62nd. 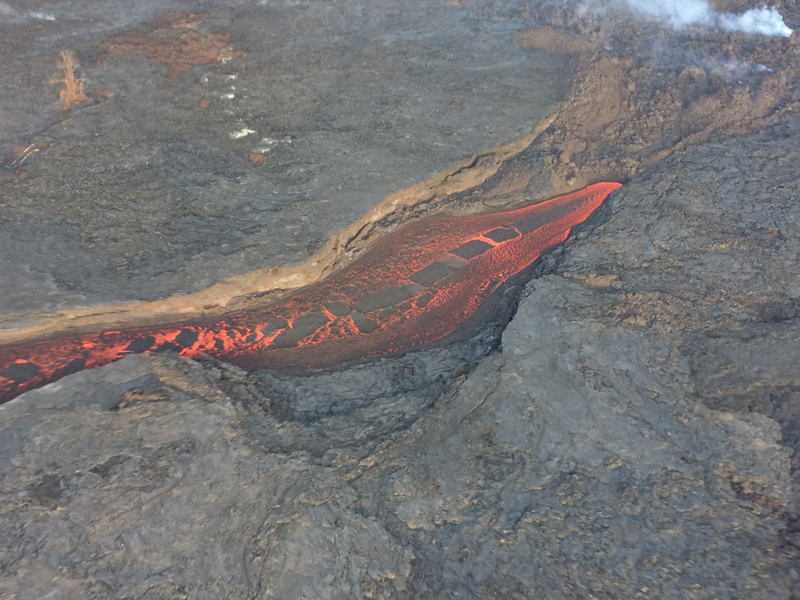 Halemaʻumaʻu Crater depth on July 22: 1575 feet (“deeper than Empire State Building is tall”), 480+ m. It was ~280 ft deep (~85 meters) back in April. 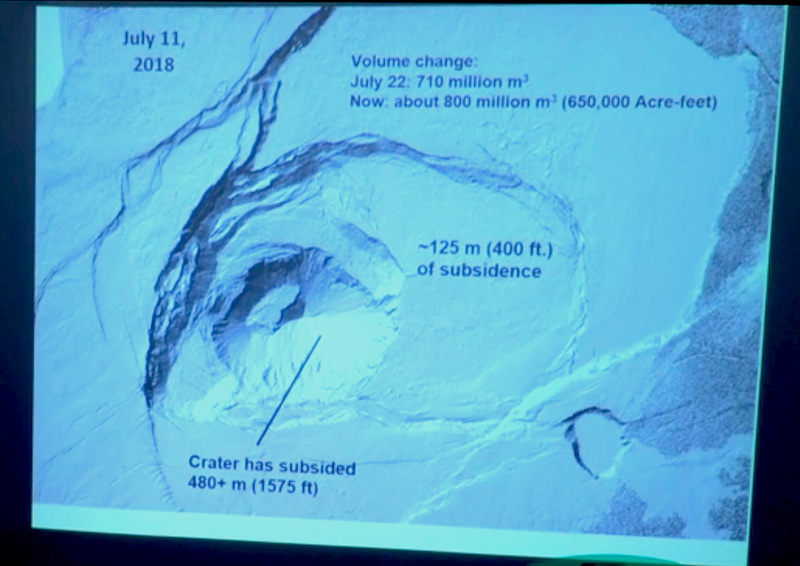 Around timestamp 15:40 in the meeting’s video, Johanson shows a timelapse of caldera subsidence I haven’t seen posted elsewhere in its entirely. August 4, 2018. 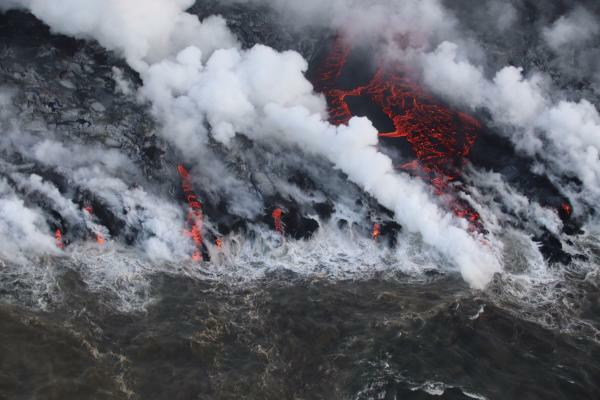 USGS: “A slightly different view of the southernmost lobe of ocean entry lava streams. 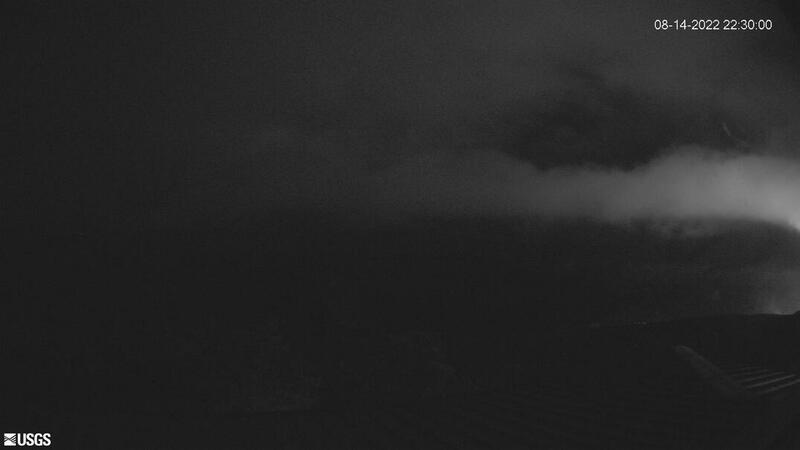 The roof of the house at Isaac Hale Beach Park can be seen through the laze plume.” (Full-sized) — note that they adjusted the lighting to bring out details in this Tweet of same photo. The Hawai’i Board on Geographic Names is meeting August 8 to discuss naming process for Fissure 8, as well as some other places. 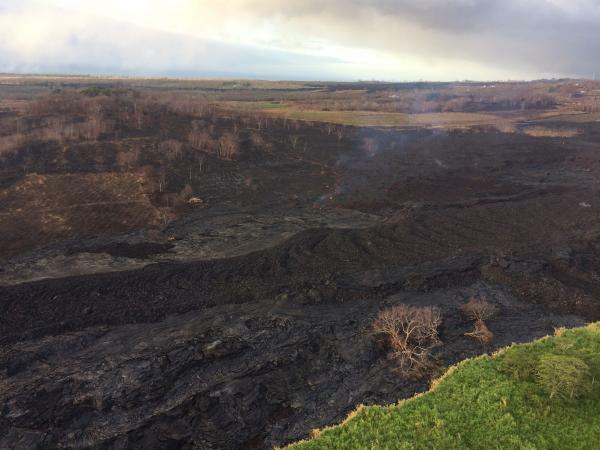 Also, not related to or caused by the eruption, firefighters have been battling a major brushfire near Waikoloa. By Saturday evening, it was 70% contained. 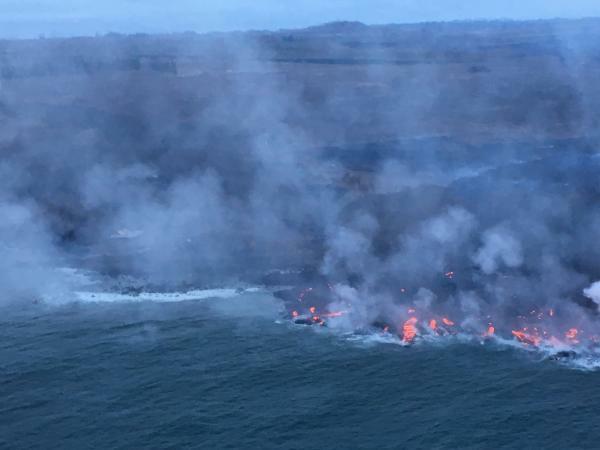 HDOT continues to keep Highway 11 open by repairing damage as it appears, as well as damaged portions of Crater Rim Drive needed as an emergency route. At a Volcano Village meeting Thursday evening, Civil Defense reported on plans to build two alternate emergency routes in case earthquakes make Highway 11 impassible. 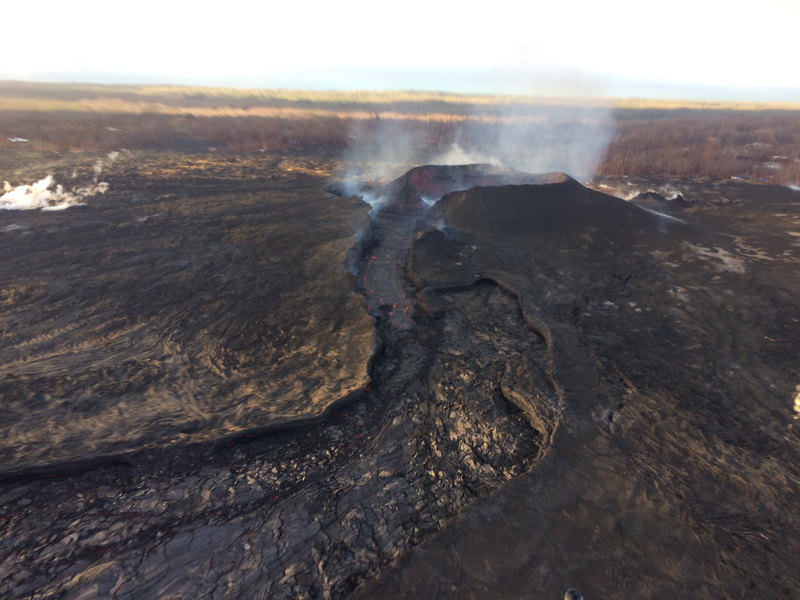 On Friday, the Departments of Health and Education announced a joint volcano response plan to address vog and ash hazards for schools and students. The new school action plans are available partway down the DOE’s Kilauea eruption webpage, which has a lot of useful disaster preparedness and assistance resources for Big Island residents. 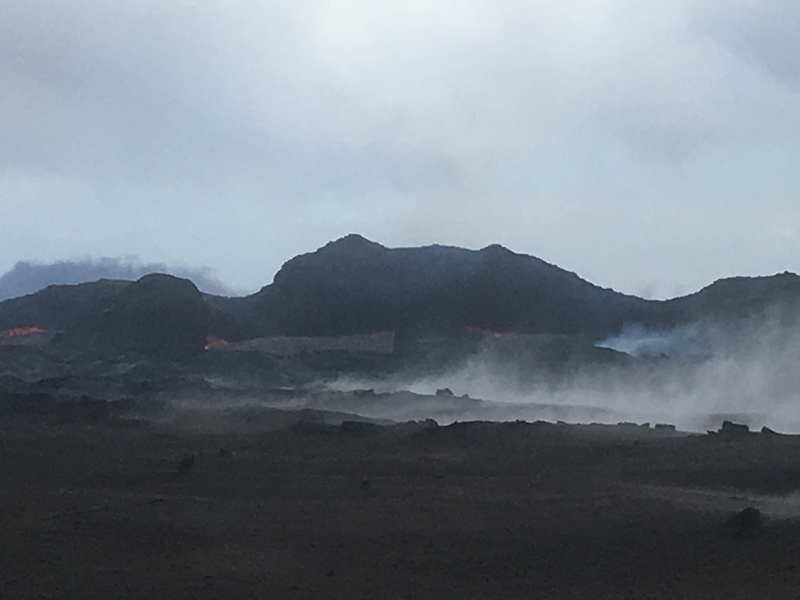 Meanwhile, Dispatches From Volcano’s Aug 3 entry identified details/features on USGS summit photos, and today’s entry warns people to be cautious of lingering hazards near lava flows, even if Fissure 8 pauses. Sunday, Aug 5, 2018, 6:00 am – Kilauea's lower east rift zone overflight: With the slowdown in lava supply from fissure 8, a recession within the perched channel is noticeable from this angle. That’s the perched channel where it widened out into a sort of lava pond. As usual, look for houses for scale. Sunday, Aug 5, 2018, 6:00 am – Kilauea's lower east rift zone overflight: A view of the eruption zone from above shipwreck corner, with overflows occurring from the lower braid through the bend. It’s worth checking out the rest of that album for close-ups of specific features along the changing flow field, and sharp-eyed observation notes. Compare with Andrew Richard Hara’s August 2 overflight photos. 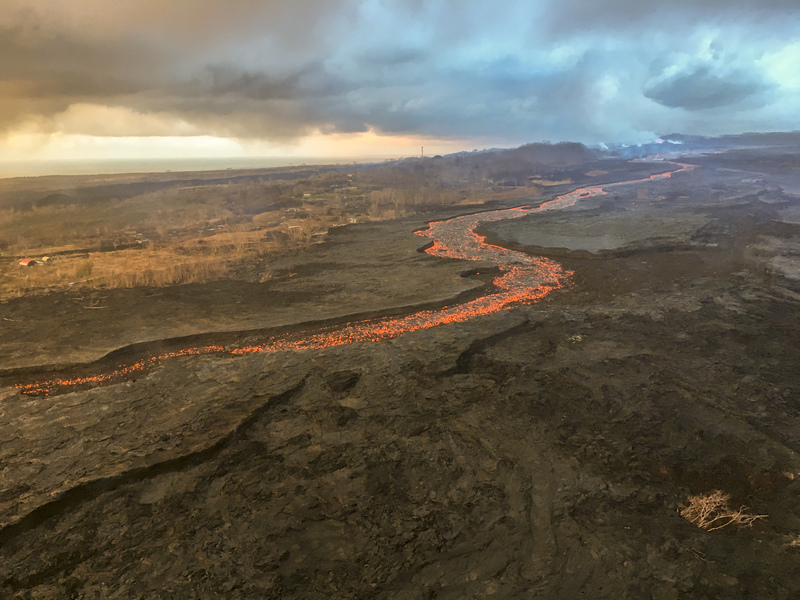 Q: If a new eruption at Pu’u O’o were to start, would it be considered new or part of previous one? USGS: We’re not really sure what we would call it at this point if Pu`u `O`o were to restart. We haven’t even had a big discussion yet about whether or not we want to call the new fissure system a “new” eruption (we’ve got passionate viewpoints on both sides). 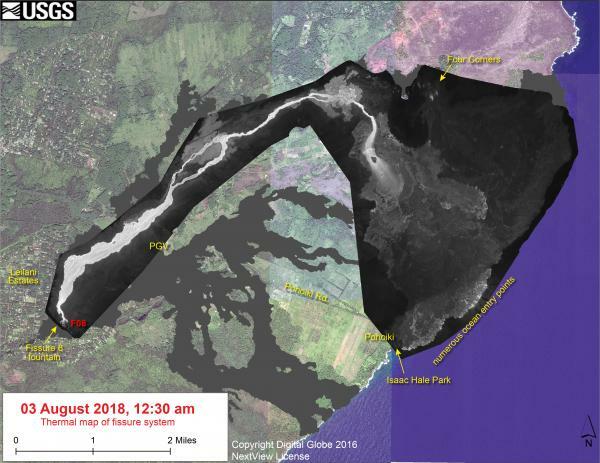 Question posted on FB this evening: Hawaii Civil Defense just posted no movement in the lava channel. Is this true? Another asked about summit inflation. 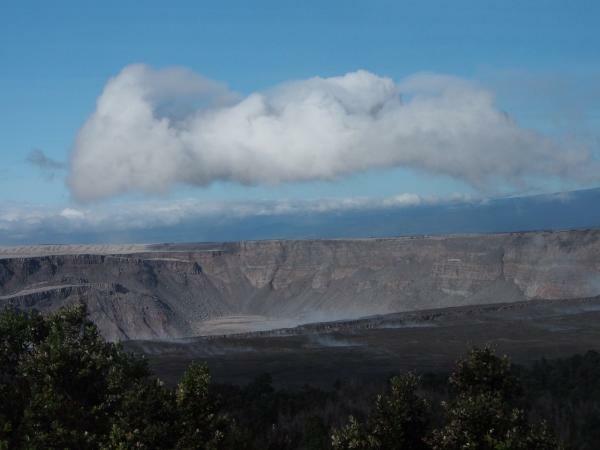 USGS: We expect things would quiet down on the volcano for a while — weeks, months, perhaps years. That would be the conclusion of the event. But these events often sputter to a close, and it might be that Fissures in the system reactivate briefly before things go completely quiet. The ends of eruptions are very chaotic and subject to numerous conditions that are difficult to forecast. 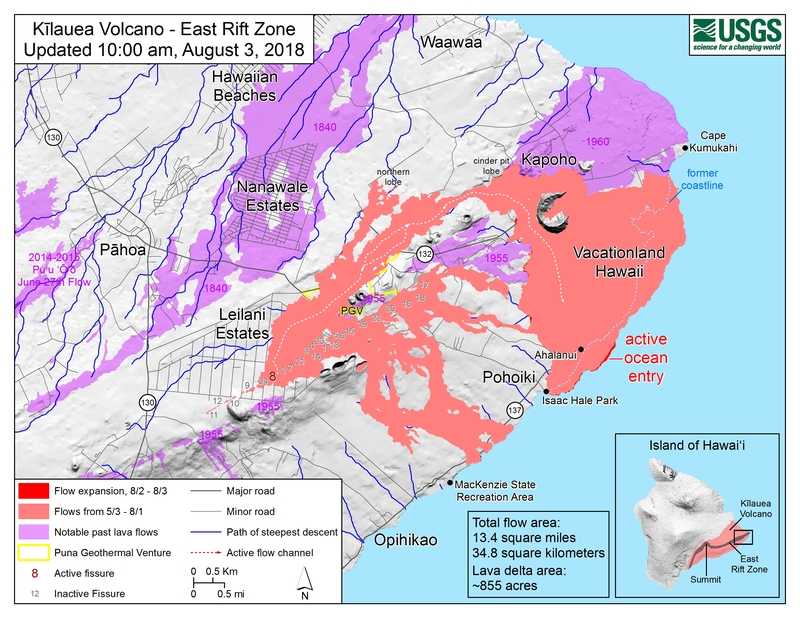 USGS: We expect the caldera will continue subsiding to some degree even after the lower East Rift Zone eruption is over…probably for a couple of months after. When it all stops, magma will return to the summit – like it has done repeatedly after collapses that followed 1925, 1955, 1960, and even after the collapse of the last caldera in the 1400-1500s. 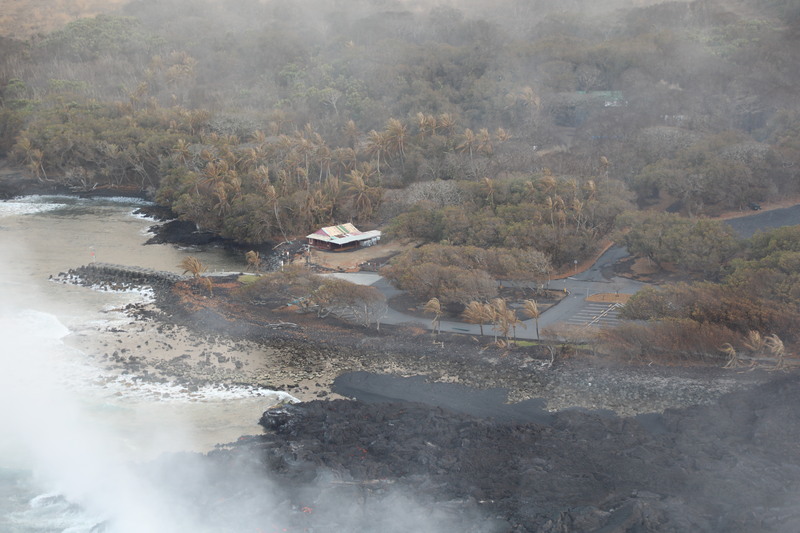 Kilauea is young and is still building itself…it will continue to do so. 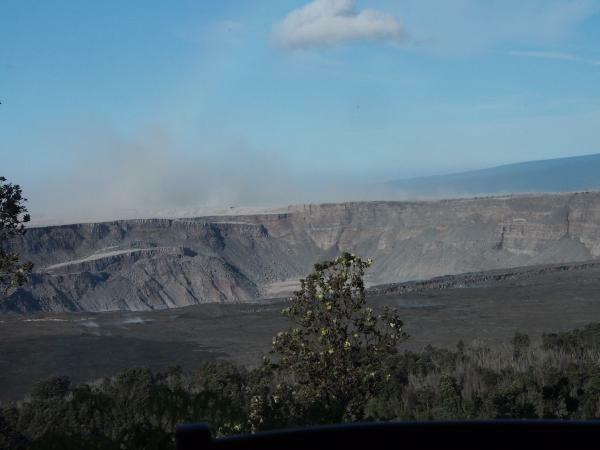 USGS: 1) The Koa`e earthquakes are a response to the downdropping of the summit. Most of those faults dip to the north, towards the caldera. We can see from satellite deformation maps that faults there are rupturing, and have been since late May. 2) We doubt that the M3 south of the summit was anything significant, given all of the other seismicity. The earthquakes are a consequence, and not a cause, of the activity we’re observing. 3) Iki is in line with other summit tiltmeters that show a leveling off of the deformation. USGS: As Tim mentions, this is kind of a waiting game. These eruptions wax and wane. But, the decrease in activity from the fissure system in addition to the flat deformation and decreased earthquakes at the summit indicates to us that magma has ceased leaving the summit storage region. We will have more analysis published in the update later this morning. 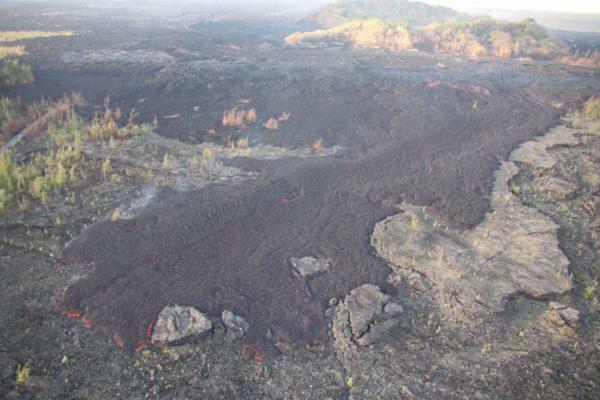 USGS: Eruptions stop when the supply of eruptable magma is extinguished. 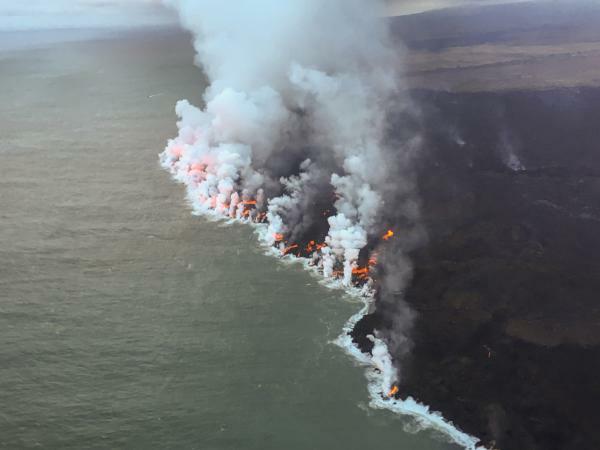 This eruption is different from historic lower East Rift Zone eruptions for a few reasons. 1) there was a lava lake AND a long-lived eruption in the middle east rift prior to change in activity (two different storage regions of magma drained and have erupted from the LERZ). 2) The M 6.9 earthquake plus foreshock/aftershock sequence occurred at the start of eruption, and we believe it opened up a portion of the ERZ that was blocked, allowing magma to flow from summit. 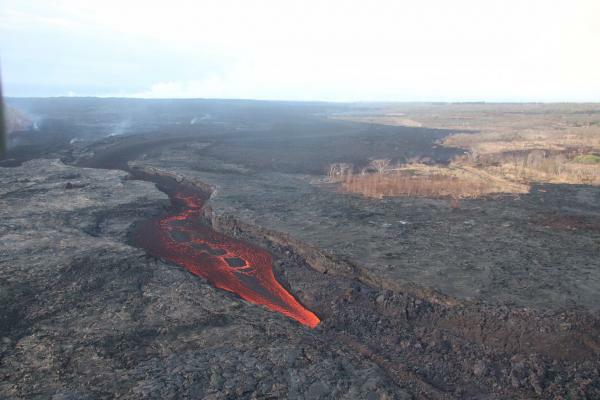 USGS: You’ve seen the video, how the surface of the lava flow chills to form thin crusts. A lot of rain could help that process along a bit, but consider that lava has been coming out of fissure 8 at (roughly) 50 to 150 cubic meters per second (65–196 cubic yards per second). 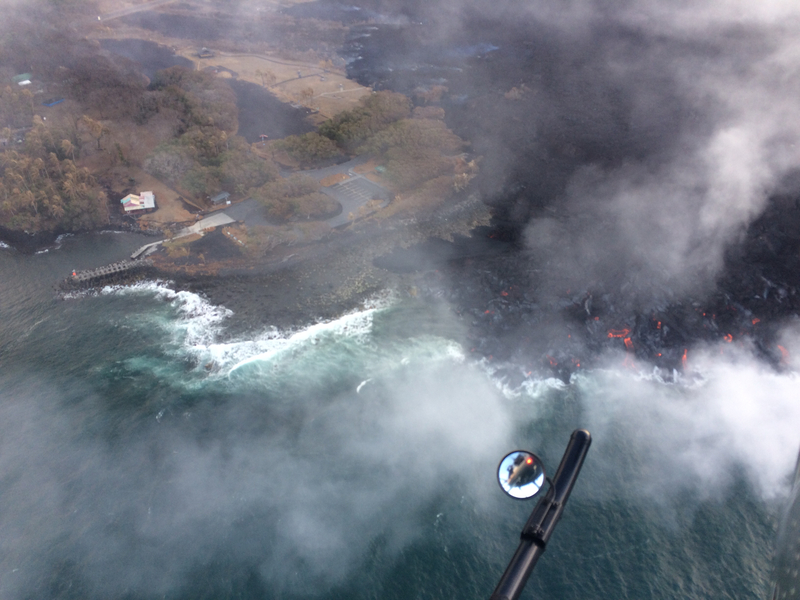 At that rate, lava will keep chugging toward the sea, even if a hurricane were to occur.